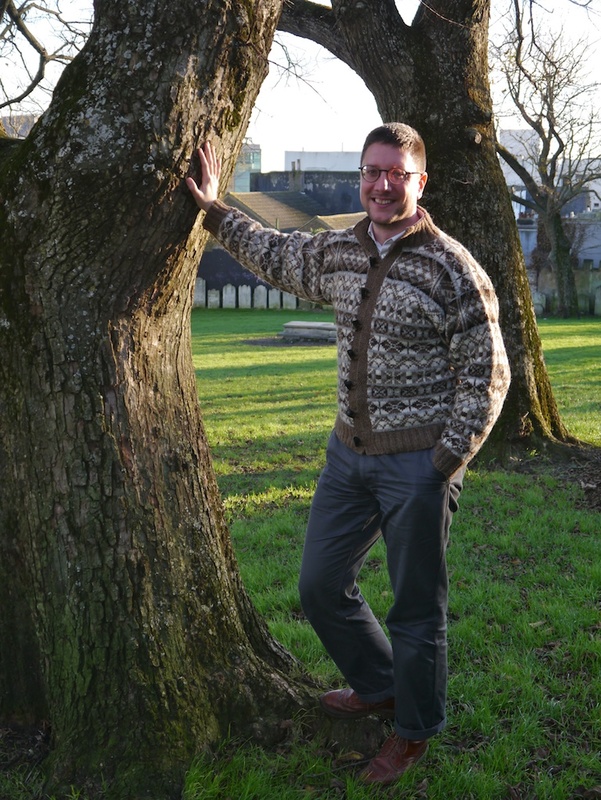 Today sees the launch of my Tom of da Peathill pattern, a fitted men’s Fair Isle cardigan inspired by the seven natural shades of Foula wool it was designed for. When Magnus Holbourn approached me last year to ask what I thought of his Foula wool, I didn’t expect to end up working with him on a pattern. 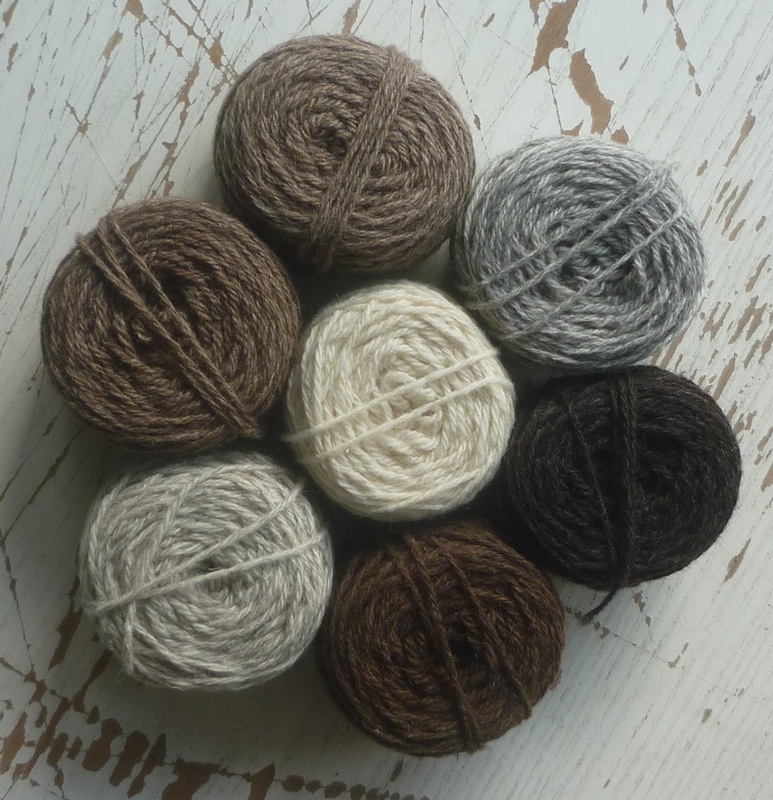 The minute the samples of yarn arrived, I was excited by the natural colours of the wool, and its very own character. Foula is the most isolated inhabited island in Britain, so it will come as no surprise that the strain of Shetland sheep on Foula is very old and has plenty of character. I tried out various patterns before settling on the combination shown in the cardigan. Having played around with many colours as part of my Aleatoric Fair Isle experiment last year, it was an interesting exercise to use only seven colours. This did make me more confident in putting the colours together in pleasing ways, and in fact, one of the Aleatoric Fair Isle swatches guided me in the choice of some of the patterns in the cardigan. The back of the cardigan. 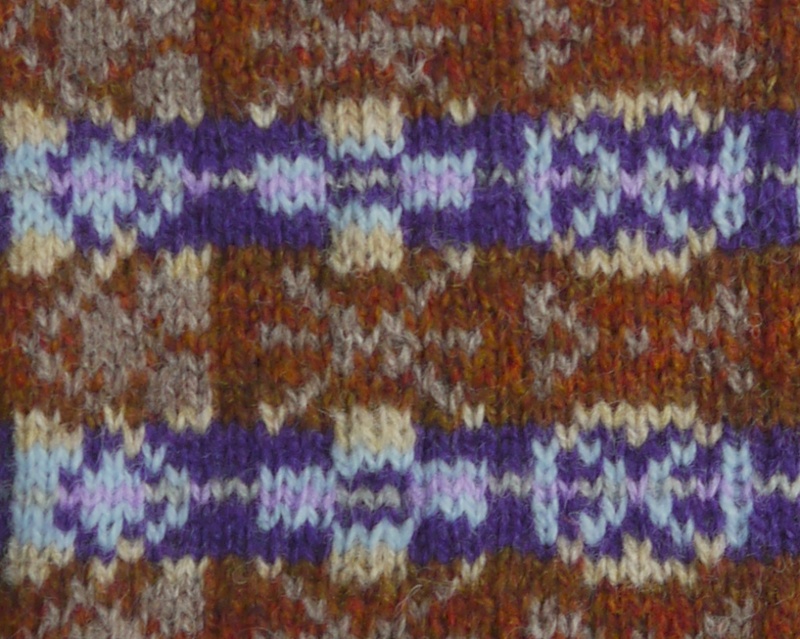 Can you spot the patterns from the Aleatoric Fair Isle swatch? The cardigan is knitted in the round, with steek stitches for the front opening and the armholes. As the yarn is a sturdy DK weight, I didn’t want to use a method that would leave very bulky seams after cutting the steeks open. Therefore I employed the knotted steek method: before you cut, you need to drop down the steek stitches, so you get a massive ladder. The strands are then cut and knotted in pairs. To finish these after knitting front edges and sleeves, the strands are darned in. 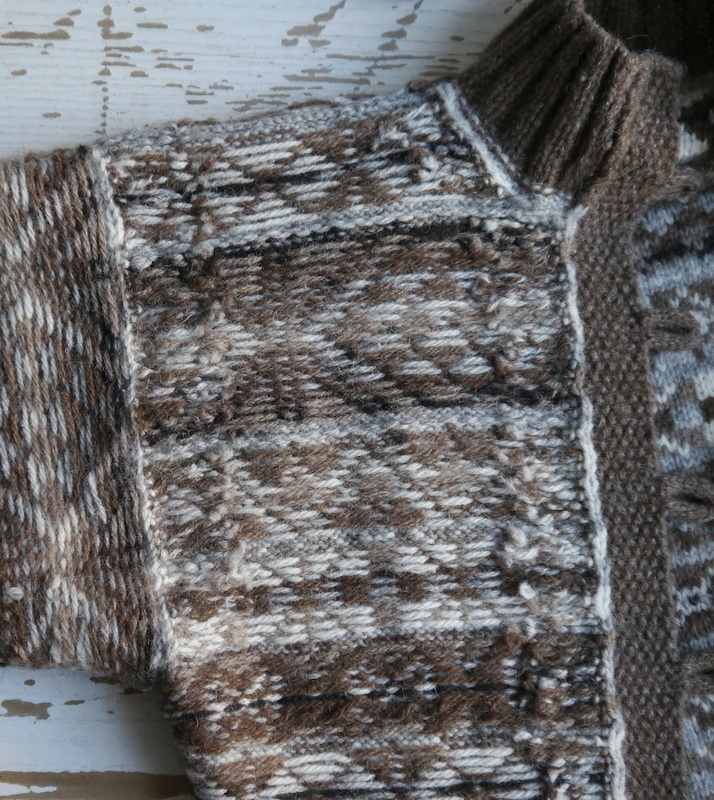 Once you’re in the rhythm, it goes quite quickly; you can find a knotted steek tutorial here. 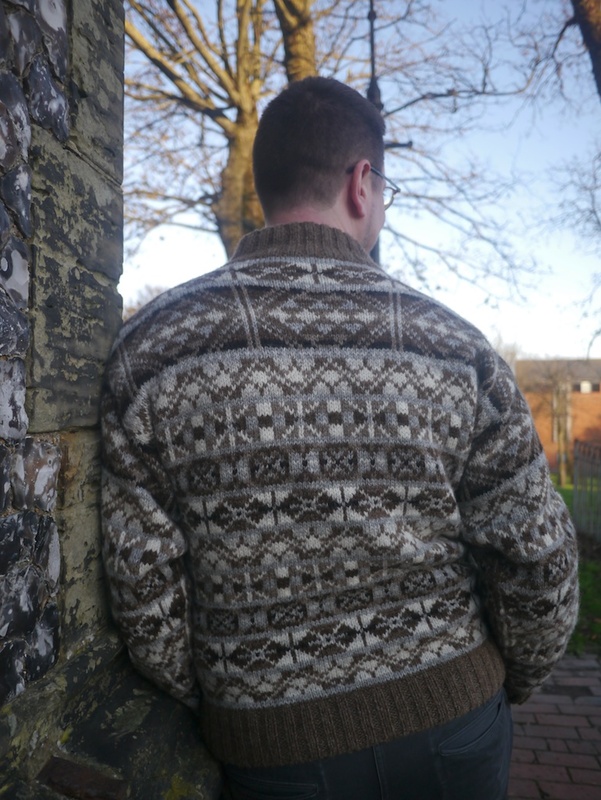 And if you’re wondering about the name of the cardigan: I originally wanted to call it the Foula Cardigan, but Magnus was reminded of the peathills on Foula, and the way that the cut peat is stacked up to dry when he saw the cardigan. And who could resist a name that is so reminiscent of the very place where the wool comes from? You can download the pattern from my Ravelry store here. And Magnus has put together a yarn kit for the cardigan here. Last but not least, I also would like to take this opportunity to thank a few people who helped me along the way with my first garment knitting pattern: my comrades in wool, Felix and Kate, who have both been very encouraging. Anna Maltz for her cheery chats. And of course Magnus of Foula Wool, who started it all of. But most of all my partner Anthony, who is always supportive of my crafty pursuits, even if I occasionally struggle to keep my wool stash under control. Tom, this is a triumph of knitwear design and truly it would be very difficult NOT to have been enthusiastic at all stages of its design and construction!!! I love everything about this – the wonderful sheepy shades of the Foula wool; the beautiful experiments with colours in Aleatoric Fair Isle, influencing your pattern selection here; and the way the cardigan seems, well, just somehow so very YOU. The knotted steeks are wonderful and the patterns have a fantastic energy and playfulness to them. I also feel like I could stare at them for days, those shades of Foula wool do indeed seem ancient. Oh, this is flippen bloody gorgeous! What a good job you did putting the patterns and colours together. ‘Everyone’ is so into bright colours and I understand it but the natural ones are the ones that call my name. Thank you. That is a wonderful sweater and design! Excellent work and very handsome! I am looking forward to more details on the knot steek treatment. Congratulations! This a garment to transcend fast fashion by, to reach for the nirvana of heirloom. It is truly beautiful, particularly in the way it feel so connected to the sheep and earth it came from. It is an artefact of Deb Robson’s idea of ‘terroir’.